Red, Green, Blue, Yellow, Orange, White, Black, etc. 30% Deposit. By T/T (Bank/Telegraphic Transfer), Western Union, Money Gram, Credit Card via Alibaba Trade Assurance, etc. Air Track has become extremely popular among gymnasts and other sports enthusiasts. 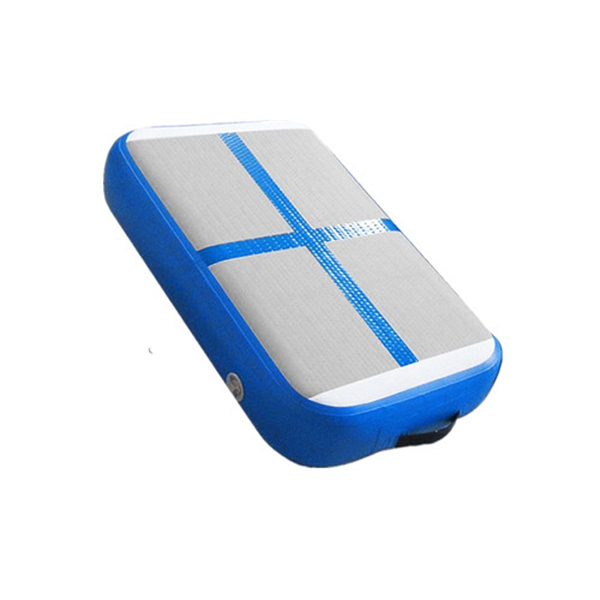 It can be used for gymnastics, sports training, yoga, kung-fu, cheerleading and even as a playing mat for kids. Q: What are Air Track made of? 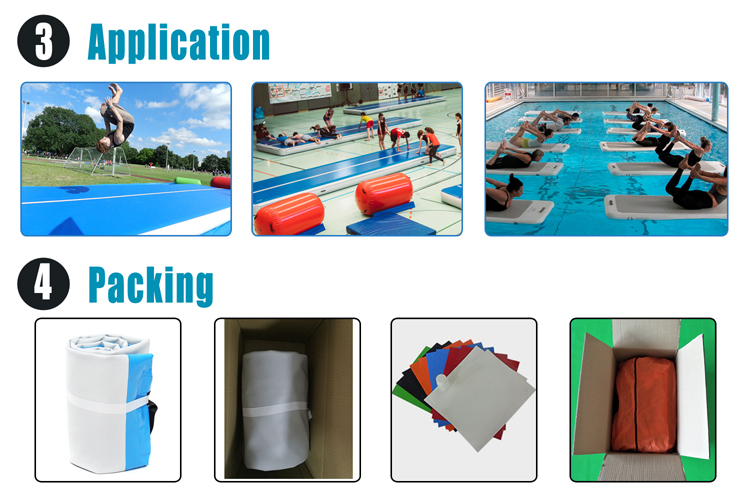 A: Our air track is made of Double-Wall Material (also know as drop stitch material), and 0.9mm thickness durable commercial grade PVC tarpaulin. 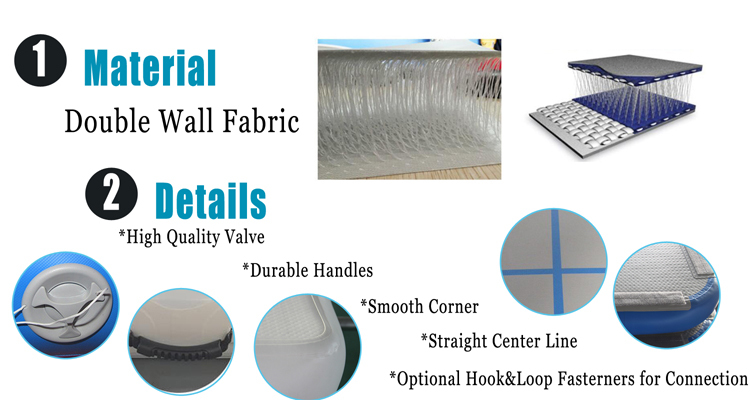 Better airtightness and durability since reinforcement are made for all seams. Q: Where can Air Track be used? A: The Air Floor can be placed on the gym floor, the artistic gymnastics floor, in high-performance training, gymnastic exercises, dance clubs, fitness clubs, schools, leisure centers,home entertainment, gymnasium, dance club, professional training, park or rental business. Also, it could be used on backyard, grass land, beach or water. Just make sure there is no sharp things or fire around. Q: What happens if Air Track punctures? A: The damage can easily be patched with repair kit. Q: How long does it take to blow up? A: It takes about 2~5 minutes to inflate by Air pump (extra US$30 per each). Q: What is weight capacity? A: Weight capacity is more than 200lb. Q: How to clean it? A: You can use soap water to clean it. Q: How to inflate and deflate Air Track? A: •Open the valve, press the valve core then turn right untill the spring in it is up. Then connect the pump with the mat tightly, then begin to inflate the mat. It's OK and enjoy your bouncing and tumbling. •Open the valve cover, press down the valve core, then it will deflate, which takes about 2-5 minutes. Q: Could it be connected? A: Yes, we can add Hook and Loop Fastener on each end of Air Track if needed. Just inform us before order.